Enjoy the north woods, state parks, hiking trails, and many other attractions close to this cozy place. Hovland Pines is a quaint cabin on a large wooded lot in Hovland, MN. This one bedroom, one bathroom cabin features a screened in gazebo, perfect for enjoying the outdoors on a buggy summer night. Hovland Pines is the perfect retreat for anyone looking to get away from it all. The living room/kitchen area of the cabin. Watch a movie on the mounted TV. The kitchen is equipped with the basics you will need to prepare a meal during your stay. The cabin has apartment-sized appliances. Off of the kitchen area is the one bedroom. The bedroom features two twin beds. Hovland Pines is beautifully decorated. The cabin`s bathroom features a small walk-in shower. Enjoy your time outside, even on the buggiest of days, in the screened in gazebo. Enjoy the charcoal BBQ. Sit around the fire pit and roast marshmallows. Hovland Pines, as you will see it pulling into the driveway. When you see this, you`ll know your home. Hovland Pines is a cozy, peaceful and private cabin perfect for a retreat. This lovely cabin has everything you need to enjoy your time up north. Being surrounded by the woods will definitely let you reconnect. It has everything you need to relax after a long day exploring the North Woods. A bedroom with two twin beds, a small living area open to the kitchen with all the supplies for in-room meals, a Satellite TV and Blue Ray for a movie night. Patio furniture, charcoal grill and fire pit for those cold summer nights up north. Head down the shore and just a few miles away you will find the Judge C.R. Magney State Park and the infamous Devil's Kettle waterfall. Stop by the restaurant at Naniboujou for a full meal or afternoon tea. 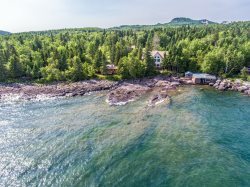 Or head up the shore just a few miles to the Grand Portage Reservation where you will find the Grand Portage National Monument and the Grand Portage Lodge and Casino, with a full-service restaurant. Also, if you want to try the best cinnamon rolls, just walk 8 minutes to Chicago Bay Market Place - Bakery! Break up the routine, pack your things and bring the best of you to this beautiful area. It's time for a North Shore Adventure! One small dog under 25 lbs is allowed with an additional fee. Sorry, no large dogs or other pets. This is a seasonal cabin open May through November.